Before taking its action, the Technical Coordinating Committee reviewed public comment, which was overwhelmingly in favor of the proposed changes. The MACORTS Policy Committee is scheduled to meet on Aug. 9 to take final action on the changes in the planning documents. Prior to the vote of the Technical Coordinating Committee on July 26, Emil Beshara, Oconee County Public Works Director, asked Sherry McDuffie, MACORTS planner, to confirm that the proposed action would remove completely the Daniells Bridge Road project from the 2040 Long Range Transportation Plan. McDuffie said that was the case. Beshara is one of two Oconee County representatives on the Technical Coordinating Committee. B.R. White, director of the Oconee County Planning and Code Enforcement Department, is the second Oconee County Representative to the Committee. The vote to send the proposed changes to the Policy Committee was unanimous. MACORTS held three public meetings on the proposed changes to its 2040 Long Range Transportation Plan and related changes to its 2018-2021 Transportation Improvement Program. The first of those was on June 26 in Oconee County and was attended by 16 people. The second meeting was June 17 in Madison County and was attended by three people. The Third was on June 28 in Athens-Clarke County and was attended by two people. McDuffie told the Technical Coordinating Committee she had received comments from 37 individuals on the proposed changes, but she said she expected the number to increase because comments were allowed until midnight on July 25. Public comments also strongly supported a grade-separated interchange for the Oconee Connector at SR 316. McDuffie reported that she had not received any comments on the MACORTS plan changes from organizations or groups. 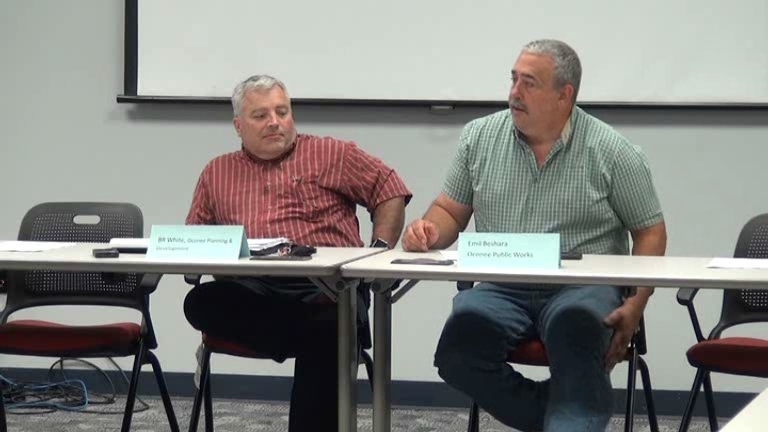 Two members of the Oconee County Land Use and Transportation Planning Committee, John Chenhall and Rick McAllister, had spoken with McDuffie about the appropriateness of that group’s submitting comments when they attended the Oconee County public meeting on June 26. The Land Use and Transportation Planning Committee had not discussed the MACORTS changes before the June 26 public meeting and, on June 28, cancelled its scheduled meeting set for July 11. Flynn Warren, a member of the Land Use Committee, is one of two Oconee County representatives on the MACORTS Policy Committee. John Daniell, Oconee County Board of Commissioners chair, is the other. “They’re supporting what we say in a negative manner,” she added. “They’re just trying to drive more nails in the coffin,” Beshara said in response. The proposal was to create an extension of Daniells Bridge Road north of the Chestnut Hill Road intersection to fly over SR Loop 10 and connect with the stub of the Oconee Connector at Home Depot. McDuffie told the group that a change had been made in the Transportation Improvement Program, removing the Jimmy Daniell Road widening from the second tier. The change was made at the request of GDOT, she said. Beshara said he had learned that Clarke County has no funding available for the project until 2020. The proposal is to widen the road from the Atlanta Highway in Clarke County to SR 316 in Oconee County and requires the involvement of both counties, Beshara said. “If Clarke County is not ready to go, we’re not ready to go,” he said. Beshara told the group that Oconee County is going to partner with GDOT Planning and one of its consultants to do a county-wide transportation study. He said this was in lieu of an earlier proposed study of only the SR 316 and Epps Bridge Parkway corridor. The cost of that earlier project was going to be in excess of $60,000, Beshara said, and the GDOT study will cost about $45,000. Darius Malone, representing GDOT Planning at the MACORTS meeting, said he was handling the contract and was waiting on the contract to come back from the procurement office. He said he expects things to move quickly. Oconee County Board of Commissioners Chairman John Daniell had announced the GDOT project at the BOC meeting on July 18. The July 26 MACORTS meeting took place at the auditorium of the Planning Department in Athens. Brad Griffin, Athens-Clarke County planning director, presided. McDuffie, sitting to Griffin’s right, reviewed the public comments starting at 0:50 in the video. Beshara gave a report on the widening of Mars Hill Road in Oconee County and the GDOT transportation study starting at 13:05. 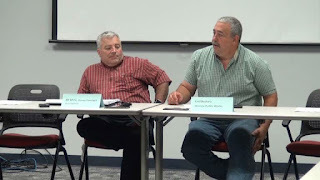 OCO: MACORTS Technical Coordinating Committee 7 26 17 from Lee Becker on Vimeo. I understand why Welbrook residents want to keep Daniells Bridge Rd (DBR) a country lane as long as possible. But as the Epps Bridge/316 signalized intersections approach gridlock in the future, that Oconee Conn/DBR (loop-flyover)link will be imperative as always intended. Now, however, it will be later rather than sooner. In Oconee County, who determines sooner and later is mysterious only to those who do not follow the money. Meanwhile, GDOT supports Oconee's relentless sprawl and "nowhere" planning. Anonymous 2:11 nails it. The resistance to a fly-over and parallel path along the gridlock - now present on Epps Bridge Road - has effectively obstructed a route planned for a couple of decades. The flyover "should" have been built back when it was affordable and less disruptive. As intended. The dithering has produced a snarl on an important corridor Athens-Atlanta. The Who and The How are indeed a mystery. Well, not really. Meanwhile, huge projects are proposed as grade-separated up and down GA 316, again at eye-popping cost and years of inconvenience. And the rest of the county? You know, where the people (aka: taxpayers) live? No where near the projects where the gigantic money is. Cheap round-abouts for a real problem in Bishop. Sorry, too small. Given that at least Xardox agrees with my previous post, I feel more confident asking Lee to explain why his was among those letters to GDOT supporting abandonment of the flyover. At least Lee disclosed his sentiments, but now I ask him to explain how abandonment serves the public interest rather than of the private moguls to whom GDOT largess is to be diverted. Your turn, Lee. I think the loop may have been a good idea when it was proposed more than 20 years ago, but the county has made many decisions since then that make it unworkable today. When it reconfigured Daniells Bridge Road after 1997 to link it to Mars Hill Road and the new Oconee Connector, it did not straighten the road and make it able to handle additional traffic from the flyover. Prior to that, it rezoned property allowing for the expansion of Welbrook Farms up to Chestnut Hill Road, putting those homes close to what would be the loop. And it rezoned land for the present Zaxby headquarters and the planned future Zaxby's campus that would be necessary to create a loop. There is no place for traffic coming across the flyover to go. County staff have said repeatedly that there is no "logical terminus" for the flyover as the road system currently is structured. Finally, if off ramps for the Loop are added to the flyover, as was proposed in the most recent rendition, there is no guarantee that the flyover would relieve traffic in the busy Epps Bridge Road corridor. It might well do the reverse. These are the reasons I supported the MACORTS decision to remove the Daniells Bridge Road extension and flyover from its plans. Lee's insights are helpful. I was not aware that Loop connections were planned at the flyover, and simply viewed it as a second way to connect Epps Br. shopping with Oconee residential. Without any alternatives, that 316/connecter area will become an impossible bottleneck. Wait until Christmas to find out, as we experienced on the Atlanta Hwy prior to its commercial flight. I agree that crummy county planning has subverted the flyover function. But I believe flyover abandonment only contributes to it, and cannot be justified in long-term even if $$ is "better" spent elsewhere short-term.